Qutub-Minar is one of the beautiful minaret present in Delhi covered with lush green garden all around. It is the masterpiece of Indo Muslim art built in red sand stone and marble. Qutub Minar is a UNSECO world heritage site present in Mehrauli, Delhi. Qutub-Minar was built by Qutub ud din Aibak in the year 1192 but was later completed by his son in law by Iltutmish. It is 73 metre tall and one of the highest brick minaret in the world and also one of the most important tourist place in Delhi. It consists of 379 steps, the diameter of the base is 14.3m while the top is 2.7m. Every year lakhs of visitors visit Qutub Minar. Qutub ud din Aibak was the founder of Delhi Sultanate. It is believed that the minaret was dedicated to sufi saint Qutbuddin Baktiar Kaki. Aibak built the ground storey on the ruins of the Lal kot, citadel of Dilika the remaining three storeys was added by Iltutmish in the year 1220. In the year 1369 a severe lightening struck Qutb minar which caused severe damaged to the top storey. However this was reconstructed by Firoz Shah Tughlaq and one more storey was added to it. 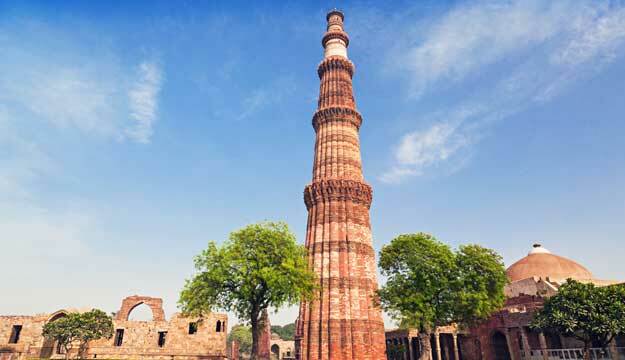 Again in the year 1505 a severe earthquake damaged the top two storeys of Qutb Minar which was reconstructed by Sikander Lodi. After another natural disaster ruined minar in the year 1803, Major Robert Smith of British army took the restoration work in the year 1828. He installed cupola on the fifth storey thus created on more storey on it. However in the year 1848 the then governor general of India ordered to reinstall the cupola on the ground level and it is still present to the east of Qutub Minar. The architecture of the minar is indo Islamic style. The first three storeys are built by red sand stone and the next three are built in sandstone and marble. The minaret consists of 379 steps which allow reaching to the top. However, now public are not allowed to go till the top of the minaret. 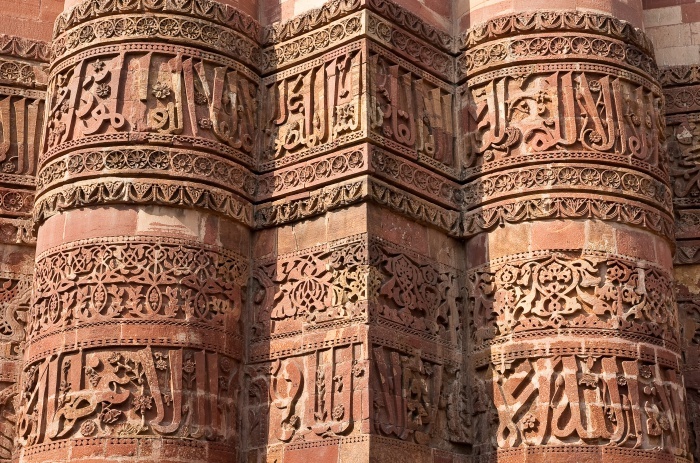 Qutb Minar is engraved with various inscriptions in Arabic and Nagari characters. The inscription describes the history and the various kings who worked on Qutb Minar. Each storey has a balcony all round supported by corbels with honeycomb vaults. It is built on the ruins of the Lal Kot. At the foot of the tower is the Quwatt ul Islam the mosque. Some of the important places in Qutb Minar is the iron pillar, Alai Darwaza, Quwatt ul islam is the mosque, tomb of Iltutmish. The iron pillar is the main attraction in the Qutub Minar. It is 24ft tall goes back to the period of Gupta dynasty erected by Chandragupta 2. It has inscriptions in Sanskrit and Brahminic scriptures. The pillar was also built to honour the Hindu God Vishnu. The most unique feature of this pillar is it is rust resistant. The myth is that if one embraces the pillar backside and touches the both hands then ones wish get fulfilled. 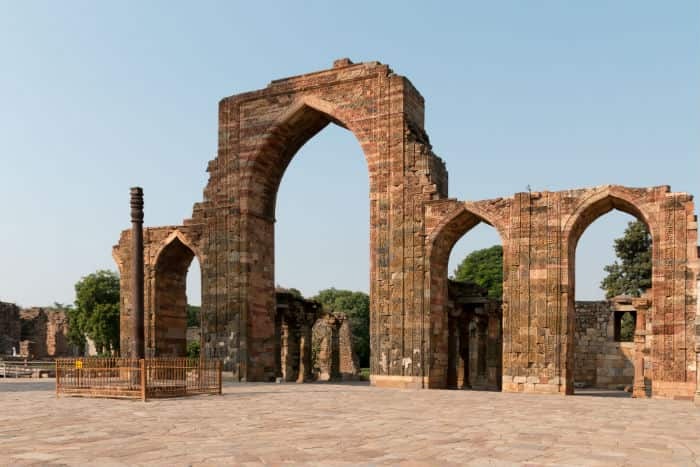 Quwatt ul Islam is a first mosque built in Delhi by Qutb-ud-din-Aibak in the year 1192. It is situated to the north east of Minar. It is believed that the mosque was built on demolishing the Hindu and Jain temples constructed during the period of tomars and Prithviraj Chauhan period. Inscriptions on the eastern gate say that the mosque was built after destroying 27 Hindu temples and Jain temples. The mosque is in ruins now but however it was built on the courtyard measuring 141ftX 105ft. Only a sanctuary on the western side with low domed ceilings for worshippers is present now. Illtutmish further developed the mosque by extending the area of the prayer hall by three more arches. Some more additions to the mosque was done during the period of Alauddin Khilji. Another important monument in Qutub Minar is the tomb of Iltutmish. It is located to the north west of Quwatt ul Islam mosque. It was built in the year 1235 AD. The interiors walls are richly decorated and beautifully carved. Iltutmish himself built the tomb. The tomb chamber has a cenetoph at the centre and is built in red sand stone. Inside the tomb there are three miharabs. Alai Minar: It is an unfinished monument that is present in the Qutub Minar. It was built by Allauddin Khilji to commemorate his victory over. He wanted to build the tallest Minaret (taller than Qutub Minar) but could not complete as he died in between. The remains of Alai Minar lie even now in Qutub Minar. Qutub Minar is a must visit place for tourist. Even though many natural disasters hit the Minar, it still stands tall, beautiful and attracts thousands of visitors every day. It is open t visitors from morning till evening. Nearest metro station: Qutub Minar metro station.